We have a new family member in the house. 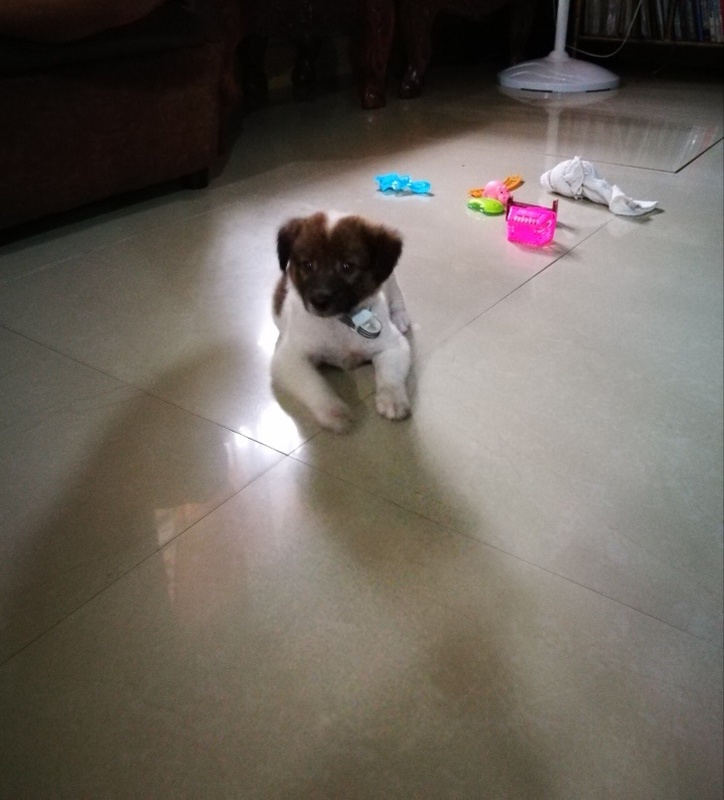 His name is Digong, our little cute puppy. He is the love of the family. We love to pamper him. He has no cage and leash for now as he is still approximately two months old. He fed on milk but yesterday, we discovered that he loves to eat rice and tuna flakes in oil more than the commercial dog food bought for him! My son gives him dog treats and Digong is such a good eater! What a cutie dog he is! He had not his bath yet as the weather is not warm, lately. He is just cleaned up by way of wet wipes. The issue he has for now is fleas and we are hoping that the anti-flea will work on him. He will have his first visit to the vet next week for deworming and later for vaccination. The adorable Digong is a replacement of our demised dog named Barack. Welcome, Digong! In the recent earthquake that happened in my province, there were a lot of destructions to properties aside from casualties it havoc to people. Of course, the widespread power black out in my province and in nearby provinces also brought negative consequences to households and negatively impacted the economic sectors but there is one positive consequence I learned out of the power interruption. Families had more time to bond together and talk intently because electronic gadgets and wifi connection was absent or limited. One bonding moment, for example, is singing together. The guitars which were once left to stay alone and dusty in the corner became the center of attraction. Why not? Guitars have quality sound especially those that are with a quality compressor pedal built in on it. The sound of our guitar at home signifies it has a quality compressor pedal. Its sound is a far cry from the cheap guitars sold in cheap musical stores. I sure have the best buy for the cost of my guitar. Sleeping late in the night recently has been frequent for me. Why? I keep on tweaking my new cell fone for the familiarity of its features. I relish on the feeling of having a new cell fone, excitement runs over me to try on its camera which has a better image resolution than my old cell fone. I now use the earphones, too as I love the sound quality of this new cell fone. I waved goodbye to my two-year old cell fone and handed it down to my younger son. Well, it served me best for the last two years that it was in my possession. But, I found a better alternative and so my new fave is now my new cell fone. I have a bigger data plan now for my new cell fone. Anytime, when needed I could access the internet and other sites as I have a faster access now to the internet. I feel pampered and loved with my new cell fone. The recent fiesta in my city, Tacloban City, was so festive. There was the parade of lights during the night of June 30. For each cluster of contingents, there was a musical band from the bugle corps of participating schools. Music played a great part in the festivities. I remember way back in high school when I was a member of the bugle corps of my school. We rehearse new dance songs from time to time. I played the clarinet. Every music played does not go well without the clarinet. There were two of us in the band that played the clarinet. The school provided our clarinets. I wonder if the clarinets were best buy from musical stores that have clarinets for sale. I know of a place to visit that that sells quality musical instruments. Aside from the best quality of musical instrument, there is also the best sound quality. Best value for money, indeed. Next year, I am pretty sure that the street parades will be as good as the recent one or maybe even better than it. An earthquake shook this part of my province at a magnitude of Intensity V. It happened at 4:03 pm. I was still in the Office when it happened. I had the slightest idea that the earthquake will not have that intensity and duration. The depth of focus was 050. According to Wikipedia, in seismology, the depth of focus or focal depth refers to the depth at which an earthquake occurs. Earthquakes occurring at a depth of less than 70km (43mi) are classified as shallow-focus earthquakes, while those with a focal depth between 70km and 300 km are commonly termed mid-focus or intermediate-depth earthquakes. My goodness, the earthquake that happened in my place was of a shallow depth, however, it caused tremendous damage to many infrastructures and caused casualties to the most number of people. Fear once again gripped among many especially the children and those that have experienced the wrath of the strongest typhoon, Haiyan about four years ago. I hope that they who are most affected will fastly recover.